The number of housing transactions is down. Up until May of this year, monthly transactions were up an average of 34% above the level recorded in the same month last year. Transactions dropped off in June. 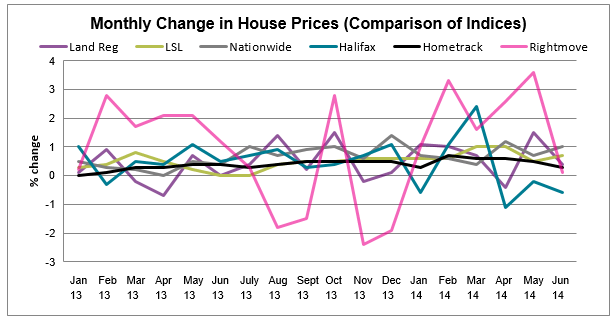 By comparison, they are estimated to be up 10% year on year and down 6% from May (according to LSL data). 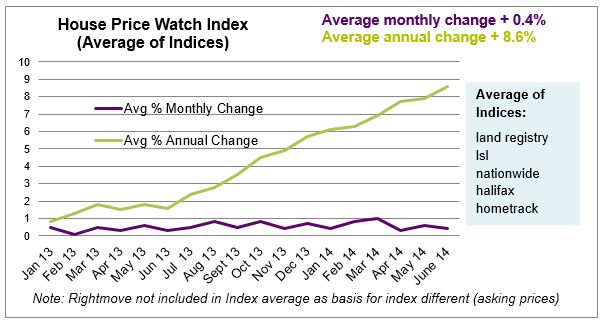 Reports show buyer demand is also beginning to tail off. Hometrack’s monthly survey of estate agents and surveyors indicates there was no growth in new buyers registering with agents in June; a major change from the trend over the past 18 months. Mortgage Market Review measures, with greater emphasis on affordability alongside additional guidance on stress tests, may also be contributing to a slow down. In the past month, house prices are down slightly in the Northern regions and have continued to edge upwards in the South, East and Midlands. How will the new mortgage lending rules effect me?